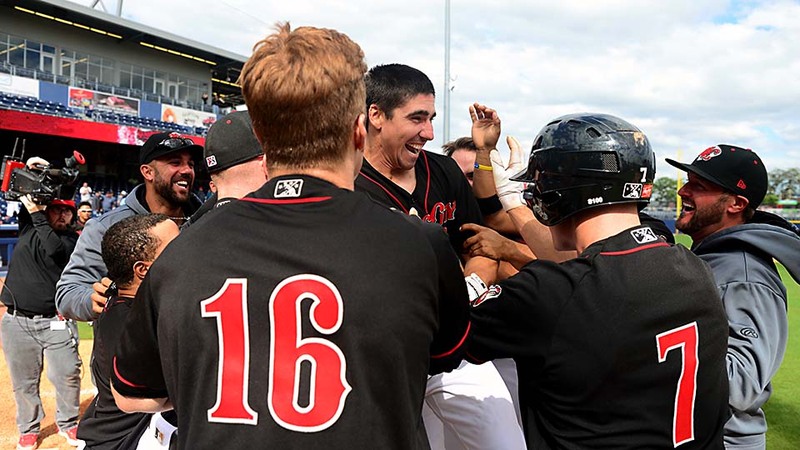 Nashville, TN – Matt McBride hit a walk-off two-run homer in the bottom of the 12th inning to give the Nashville Sounds a dramatic 6-4 win over the New Orleans Baby Cakes in front of 8,262 fans at First Tennessee Park Monday afternoon. With the score even at 4-4, Franklin Barreto laced a two-out triple into the right-center gap to set the stage for McBride. He hit the first pitch from lefty Kelvin Marte into the left field seats to give Nashville (10-11) the abbreviated four-game sweep. The Sounds’ offense was stuck in neutral for the better part of the afternoon. Baby Cakes pitching held them to just one run on three hits through the first seven innings of the game. Nashville’s comeback started in the bottom of the eighth inning when Renato Nuñez belted his team-leading fifth homer of the season, a solo blast to left-center to trim the deficit to 4-2. After Sounds reliever Bobby Wahl tossed a 1-2-3 top of the ninth, New Orleans turned to right-hander Brian Ellington to try and close it out. He struck out Matt Chapman for the first out in the inning before the Ryan Lavarnway sparked a rally with a double down the left field line. Kenny Wilson immediately collected a double of his own, plating Lavarnway to make it 4-3. Wilson then stole third base and raced home moments later when Melvin Mercedes lined a base hit to right field to even the game at 4-4. Ellington escaped further damage but the game continued into extras where Nashville relievers kept it rolling. Tyler Sturdevant, Wahl, and Josh Smith combined to throw five scoreless innings to give the Sounds a chance. Both teams squandered run-scoring opportunities in the 10th. New Orleans and Nashville had a runner at third base with less than two outs but failed to score. McBride’s blast was the first walk-off win of the season for the Sounds who have now won four consecutive games. The Sounds hit the road for a four-game trip in Round Rock, Texas. Game one of the series is scheduled for 7:05pm Tuesday night.